The White House Ornament Collection presents the 2006 White House Ornament Gift Set. 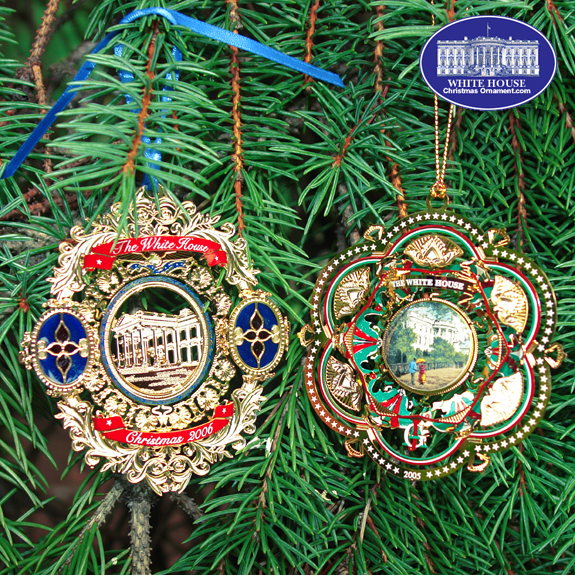 The design of the 2006 ornament is inspired by President Arthur's insistence to redecorate the White House. He brought 24 wagon loads of furniture, some including pieces dating back to John Adams' term, carted away and sold at public auction, and Arthur commissioned Louis Comfort Tiffany to replace them with new pieces. A famous designer now best-known for his stained glass, Tiffany was among the foremost designers of the day. The 2005 White House Christmas ornament is gold-plated brass with a round ceramic stone that features an illustration inspired by a period engraving of the South Front of the White House. The 2005 White House ornament honors President James A. Garfield, a preacher, educator, soldier, and politician. The last of the log cabin presidents, he attacked political corruption and restored a measure of prestige that the presidency had lost during the Reconstruction period.